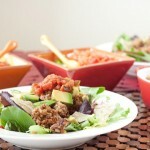 Taco salad is one of my favorite Mexican dishes. Instead of cooking up ground meat, try opting for a grain + pulse based “meat”. High in fiber, and protein, this salad is light and refreshing and wont weigh you down. Place water, rice and coconut oil in a medium saucepan. Cover and bring to a boil. Reduce heat to medium low and cook for 30-40 minutes until fully cooked. Remove from heat and set aside with the lid off. Place cooked rice, beans, seeds, and taco seasoning in food processor and pulse until ingredients are broken up. Transfer to a large frying pan, add 2 tablespoon of coconut oil, and cook on medium heat for 5 minutes, or until heated through. Remove from heat and serve with mixed greens, peppers, tomatoes, and avocado. 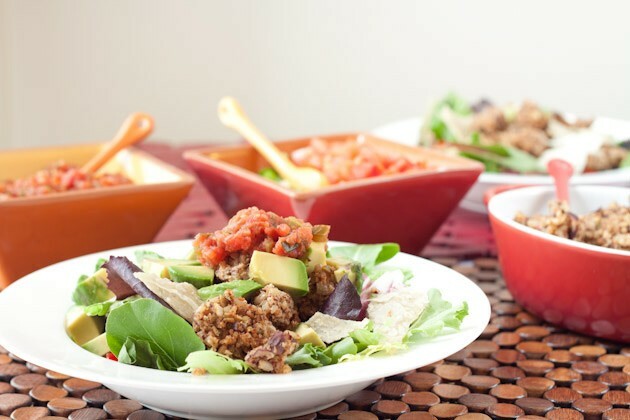 Use homemade salsa as salad dressing and top with corn-free nachos. the taco seasoning recipe will yield a bit more than what you need for the recipe. You can store the mixture in a small airtight container and sprinkle over-top pasta, mix in with hummus, or save for your next taco salad!